Too many businesses continue to build their marketing around outdated or inaccurate information regarding search engine optimization. 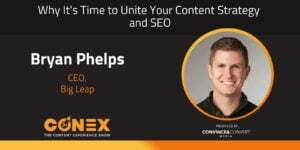 Bryan Phelps wants to change that, smoothing the all-too-common divide between content strategy and SEO. The days of keyword stuffing are over. Today, successful SEO requires a much more nuanced approach to content creation and anticipating user behavior. This evolution also means that best practices for pleasing the almighty algorithm (including perspectives on duplicate content, search ranking, and more) have changed, and content marketers must change with them. In this episode, Bryan brings his wealth of experience with SEO to dispel myths and offer solutions to marketers’ most pressing SEO challenges. 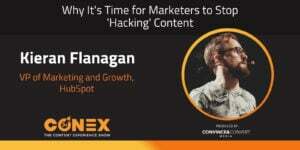 He also invites marketing teams to rethink the relationship between content strategy and SEO—integrating SEO strategy earlier into the content creation process, he explains, is a powerful way to create better and more visible content. Why you probably don’t need to panic about duplicate content. How SEO’s role in marketing is evolving. The truth about Google’s approach to penalizing content. What are some of the top things to do in Utah? Bryan recommends exploring his state’s incredible diversity of golf courses, particularly some of the beautiful red sand courses! Anna: Hey, everybody! Welcome to the Content Experience Show Podcast. You know me, I am Anna Hrach from Convince and Convert. Now, typically I am joined by my good friend Randy Frisch from Uberflip, but he is off launching his new book today. For this episode, it's just you, me and our very special guest, Bryan Phelps. Bryan is the CEO of Big Leap. Big Leap is a boutique agency out of Utah that specializes in four key things, really. SEO, content, social media and marketing automation. They do some more things, but that's really their areas of expertise. Today, what we chose to focus on is a lot of SEO. Hope you're ready, because the first part of this episode digs into a lot of those modern day SEO myths, things like, what exactly is duplicate content? Because nobody really seems to know. Or the definition of duplicate content is kind of all over the place. Plus a couple of more SEO myths. In addition, the second half of this episode really digs into the more personal side of things where we talk about how content and SEO teams and others across an organization can really all play nice within the same sandbox, because there's a lot of content being created from a lot of different teams and a lot of different priorities. Bryan helps us understand how we can get teams into alignment. Plus, he gives some great examples of some very successful teams that he's seen throughout his career. Without further ado, let's bring Bryan in and hear what he has to say about the wide world of SEO. Hey, Bryan. Thank you so much for being here. It's really great to talk to you. Bryan: Yeah. Likewise. I appreciate the opportunity. Anna: I'm personally very excited about this topic, because we have a lot of guests on. One area that we really haven't covered a lot of is SEO. I know that that's one of your areas of expertise. I'm so excited to dig into the entire SEO conversation with you today. Before we do, would you mind just going ahead and telling everybody a little bit about yourself? Bryan: Yeah. Now that you mention area of expertise, that's really where I've spent my whole career. If you go all the way back to, I think it was about 12 was when I built my first website, and it was for my mom. She actually is a fan club president for a country music singer in Nashville. Anna: Nice. Bryan: Yeah. This was back in like the AOL member site days, early early ... I'm trying to think if WordPress existed back then. Anyway, 12 years old, she was paying me in paintball gear so I could go hang out with my friend and paintball. I've always loved the internet. I used to hang out on AOL and do all that stuff. It started early on, but then in college was working for a software company doing some database work for an insurance company, insurance software company. I was really curious about these data feeds that they would get that we would use and update our database, and I sort of stumbled into the affiliate marketing world. It was just super interesting to me. I learned how to build websites on WordPress at that point. It started, I was always interested in consumer electronics, so I started with an HDTV website about the different TVs. I started learning SEO and driving traffic to that website, and then I monetized it through affiliate networks and advertising. So I really just kind of stumbled into it in some ways, had some good friends and colleagues that introduced me to it, and learned by doing it, just really hands on at the time by myself. I kept doing that and I branched out into some other areas. I ended up getting to a point where this little side thing was making more money than my day job. I eventually decided to go off from that and started Big Leap, what it is today. We don't really do the affiliate stuff anymore. We're more of a traditional SEO agency. We help other companies and people optimize their sites and drive more traffic and revenue to them. Anna: Nice. That's awesome. I also love how you went from singer fan club webpage, all the way to, like, owning and running and starting this amazing agency. That's quite the career path and trajectory. Bryan: Yeah. I kind of started, I was always a computer kid. This was in the mid-late 90s. I just was really interested in technology and computers. That's where I think I really got into SEO and really enjoyed. I do like that side of it, and SEO has a technical component to it for sure, but obviously there's a huge overlap in the marketing world too, which I've always found fascinating. It's kind of a cool combination of technology and marketing. Anna: Yeah. What's crazy, I love that you just mentioned the technical side of SEO, because I feel like whenever we do think about SEO, it has a tendency still to focus on the words on the page, and looking at what things are actually being said, what keywords. There's still this huge focus on keywords. Can you take us through, in a nutshell, where we originally started with SEO and where we're at today? From my perception, and you and I got to chat a little bit before the call, there's still kind of this focus on just very tactical keywords, but that's not what it's about today anymore at all. Bryan: Yeah. That's very true. Like you said, if you go back to the early days of SEO, and it's true in a lot of areas and content is a big part of that, again, early 2000s. People were literally, and every once in a while, I'll still stumble across it, where at the bottom of their page they just have keyword after keyword, and sometimes it's the same colored text, and that's super old school. Unfortunately, sometimes you'll just stumble across an old site. That was kind of the original version, and people figured out that, hey, Google is just looking at the words on the page, and they don't really know much else than that. It worked at the time, and so you can't really blame people for doing it, but that went on for years and years and years. Eventually, Google got better at recognizing that and just maybe not rewarding it, or even penalizing it, people were overdoing it in some ways, but they still relied a lot on what the keywords are in your title tags or in the main copy area of your page. Again, there's still a component to that, but that's evolved a lot over the last 5 to 10 years, where Google has just gotten so much better at understanding topics, and they know that, hey, if you're talking about a certain city, it's common that people are talking about, not just the city of Chicago, but there's other things about Wrigley Field and different common concepts that people talk about. They're really good at understanding what peoples' intent is and what they're ultimately looking for. Stuffing keywords on a page just doesn't do it anymore. It's really about the quality and depth of the content that we see most often, where we try to put a lot of emphasis now. Anna: The other thing that I'm happy to see people focus on too is again that technical side about how should this page actually be structured on the backend, like, what elements should each sort of piece of code describe each as. There's this whole backend that we never talk about either. Bryan: Yeah. There so is a big component of that. Google again has gotten a lot better at trying to negate the little technical problems that people maybe inadvertently don't know to fix. If you run your own business and you're publishing content, Google doesn't want to penalize you because you don't understand SEO. They've gotten better at I think overcoming some of those technical challenges, but technical SEO in a lot of ways has had a resurgence recently. There's so many different ways to build websites now. People are producing a lot more content. There's some important things about how you structure your website and link within your content to other pieces of content. Even going back to tile tags, there's things like that that still have a piece of that whole ranking formula. Technical SEO, there's a big component of that still in everything we do for us and our clients. Anna: Yeah. I still cringe whenever I see URL structures completely messy or filled with gobbledygook. I'm just like, "Fix your URL!" Bryan: Yeah. There's another common thing, especially on the content side that we see, it's a tough one. If you follow Google and some of their spokespeople that sometimes will talk about SEO, sometimes they say certain things and you have to read into it a little bit. We follow that and we want to listen to that and definitely acknowledge what they say, but we also test things out to see what the impact is. As an example of that, Google's always said having your blog in a sub-folder shouldn't make a big difference, or it's not a huge thing. But if you follow Rand Fishkin and some of the other SEO people on Twitter, they just recently have published blog posts about 12 case studies where companies moved their blog from a sub-domain, like blog.convinceandconvert.com was an example, I don't think that's the case here, but to a sub-folder, so convinceandconvert.com/blog, and without doing anything else, without creating new content or building links, their traffic instantly starts increasing because they're getting more value out of that sub-folder structure. There's technical things like that that are important. It's good to be really aware of, and it can help your content get seen by a lot more people. Anna: Yeah. You also bring up a good point, which is Google. Google is sort of this gold shiny star that everybody looks to, they're really the leader, but there are other search engines out there. What is your advice to looking at what the new best practices are, the new standards? Where should people be looking? Bryan: Yeah. It's true there are other search engines. Unfortunately, if you look in the US, it's still 90%+ Google. There's a couple sources that will actually show you a lot less, like 60 to 70%, but if you've looked at anybody's analytics traffic, it's usually 90%+. Of course it's an area we put a lot of emphasis. : Again, we like to listen to the team at Google that will come out and publish information. We pay attention to that. But we also want to pay attention to real life stories and stuff that's happening out there. We do follow them. Sites like Search Engine Land, Search Engine Journal have a lot of great information that covers both sides, Google's position on things, as well as the SEO community's portion of things. They're ultimately a great source. If you're not in SEO day to day and you want to hit the highlights and the really important stuff, following their feed is a really great idea. Anna: Nice. Okay, last question, and it does have to deal with Google. This is the last question before we jump into some much deeper questions. I wanted to start off with just demystifying some of SEO. There's still just a lot of gray area, there's a lot of, as you had even mentioned, Google releases updates and we kind of have to read between the lines, they're not always forthcoming with how they're doing things or why they're doing things, they just kind of release updates when they feel like it. I still get this question all the time, and I'm sure you do too. Duplicate content. What actually qualifies as duplicate content? You have people saying everything from, if you even have a paragraph of content duplicated on another page, Google is going to see it and flag it. All the way down to, no, you actually have to have hundreds of thousands, or at least thousands of duplicate pages or something that looks like malicious intent. Where on that scale of extremes is duplicate content? What exactly does Google think of it? Bryan: That's a great question. I do get that a lot. I think there's a lot of misunderstanding about what that is and what it means. I'll give you a few examples. I think if you again go to the extreme scenario where, hey, you build this website, a marketing website and you're just pulling in everybody's blog content just completely duplicated onto your site, if you have this really extreme scenario of just thousands and thousands, that's all you do is duplicated content, in those scenarios, I think you can really run into a problem of being penalized, or Google just saying, "We're never going to show your website. It's duplicated, and it's not adding value to anybody." Another scenario though where we get questions sometimes is local pages. For example, if you're on the travel space, if you're a car rental company, they have pages for all the cities where they have offices or locations. If someone's searching for a rental car in Chicago or a rental car in Atlanta, they have pages for those. In certain industries, it can be tough to really come up with something really unique and valuable in those areas. That's an area we've actually done a lot of work with multi-location companies. In the best-case scenario, if you're really invested, have the resources, we still try to make those really unique. We talk about other things about just directions, how to get to this location, anything unique about that location, local reviews. We've done that with a lot of companies, where especially in their major markets, we'll have really unique content. But there are scenarios where it may make sense to have portions of that content duplicated. You're talking about a new promotional campaign or something like that in the rental car space, that can be duplicated without worry I think. One of the things that, again, I think is misunderstood in duplicate content sometimes, it's not always a penalty. Sometimes it's what I'd call more of a filter. Let's take that example. Multi-location, you have similar content on all these pages. If someone's searching for a Chicago rental car, Google only wants to show one version of that content, so they're going to find the best one, and that may be the Chicago page on Avis.com, and let's say a competitor copied their page, they'll exclude that one. It's happened a lot in the old SEO world, is you'd have multiple versions of the exact same content on page one. Now, Google's just trying to do a better job of filtering out the copycats and keep the original source in that. They don't always get it right unfortunately, and that's frustrating. It's one of those things, again, we love unique good content, adding value to potential customers and search engines, but there are cases where it may make sense to have some duplicated content. Anna: All right. Basically, moral of the story, don't go copy someone else's blog thousands of times, but if you have a couple of pages that have some repeating content, you're most likely okay. Bryan: Yeah. It can change situation by situation. People don't need to be scared about it. I've heard of people worried about their copyright or terms and conditions pages duplicated. You're not going to get penalized. There's lots of open-source versions of those out there. I don't think any of us are too concerned about getting traffic to those pages from search engines, so it's not going to rank for anything, and that's fine, but your whole site's not going to be penalized because you're using a version of a terms and conditions page that's available out there for use. Anna: Nice. I'm glad we got that cleared up. And now that we have a lot of those sort of hot topic tactical questions out of the way, Bryan, I want to take a quick break, because I want to come back and talk to you about some tougher questions that I have, and even scenarios that I've encountered with things like teams and getting them to play nice in the same content sandbox. Everybody, stick around, and we are going to be right back with Bryan. Jay: Hi, friends. This is Jay Baer from Convince and Convert remind you that this show, the Connect Show Podcast, is brought to you by Uberflip, the number one content experience platform. Do you ever wonder how content experience affects your marketing results? Well, you can find out in the first ever Content Experience Report, where Uberflip uncovers eight data science backed insights to boost your content engagement and your conversions. It's a killer report. You do not want to miss it. 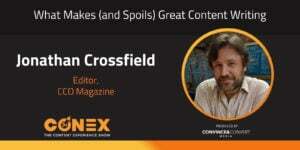 Get your free copy right now at Uberflip.com/conexshowreport. That's Uberflip.com/conexshowreport. The show is also brought to you by our team at Convince and Convert Consulting. If you've got a terrific content marketing program but you want to take it to the very next level, we can help. Convince and Convert works with the world's most iconic brands to increase the effectiveness of their content marketing, social media marketing, digital marketing and word-of-mouth marketing. Find us at Convinceandconvert.com. Anna: Hey, everybody. Welcome back. We are here with Bryan Phelps, and we just got done talking about a ton of tactical SEO questions that were burning on my brain and burning in all of your brains as well. Bryan, I want to talk about some tougher scenarios, right? It's kind of easy to get through some of the how-tos and the tips and tricks on what to write or how to structure the site. But there is one sticking point that I think a lot of companies and a lot of departments are still struggling with, which is, especially with so many different departments creating content across organizations, how do you get them all to play along in the same sandbox, and optimize content properly without it going one extreme of sounding overly optimized, all the way down to the other extreme of not being optimized at all? A lot of times, these different departments creating different content have a lot of different priorities, they have different goals. Optimization sometimes isn't always at the top of the list. How do you get people to play nice together? Bryan: Yeah. That's a tough question. I think as marketing departments are evolving currently still and have over the years, it's been interesting to see with our clients how those teams are structured and how they work together. If you go back years and years ago, it was true, and I was actually this guy at an in-house company before I started Big Leap where I was the only in-house SEO guy. People kind of viewed it as it's almost its own channel, we can hire somebody or hire an agency, and they can just take SEO and run with it, but it really doesn't work that way. SEO really in a lot of ways is a combination of lots of other skillsets, and a huge one of those is content. There's the web dev technical side, there's PR sometimes that gets involved. Hopefully, I think companies more and more are evolving a bit where the SEO team isn't, they have their KPIs and metrics and they're accountable to certain things, but they're almost an internal consultant in some ways where they're working across multiple teams. Sometimes that comes into play as kind of being a checkpoint like in the content process where they have some input and review. Then we're seeing with some companies that maybe are a little bit more SEO focused where that's a big opportunity for them, they may even be involved with that content team or they report to the same person or one in the same team. Just as an example, we worked with a software company for years and years at a small content team, and we were working with them, and they were running on their own. Over the years, we found that we work really well together by starting at the beginning of that process and helping them with the right ideas and topics to cover and the research. Again, going back to that, what words to use, and what are the different topics we want to cover. We base all that a lot of times on the search volume and opportunity. The way I think it's helped those companies and the content team where they actually really love the SEO team's input for once is their content is driving more traffic, it's getting seen by more people, it's contributing more. I think content people that can rely and get input and advice from SEO team, their content's going to perform better, and ultimately helps them look better as well. So yeah. There's probably lots of different ways to structure teams and different approaches to doing that. I think every company is different. I don't think there's one right answer necessarily. Anna: In your perspective and from your experience, what are some of the more successful ways to structure those teams so that the writers get the right balance of optimization, but then also SEO is brought into strategy at the right time and they get to help inform things? What's that right mix and that right blend or that right structure? Bryan: I think one of the most successful examples I've seen is, again, a small software startup, had a smaller team working with agencies and everything, because they'd grown, SEO became more of a staple with everybody. We do this as an agency, we'll come in if they have a content team and do lots of training and help them be self-functioning from an SEO perspective in some ways with the content team, they understand the value of linking from this current piece of content they're writing to a previous one that's related, and of course there's SEO benefits to that. Again, going back to that company, that structure that they've set up, they have both the SEO team and content team reporting to the same person, a director of marketing or digital marketing or VP of marketing, and really enabling that content team through education to go out and do a lot of it on their own, and then having an SEO person there as kind of that checkpoint and the research to find here's some additional topics or things we want to rank for that we don't now. It really creates more of this team vibe where the SEO team recognizes the content team is awesome, that what they do, they write well, and if I help them give them the tools they need, then we can both succeed. Anna: Nice. In terms of getting SEO and just practitioners in sooner on the strategy, how do you recommend and where do you recommend they come in? Because a lot of times, I think we still SEO as this sort of tack-on end-of-process piece, but it's actually, I mean, it's across the entire spectrum of content development and strategy. As content people, how can we start to pull SEO people in sooner? Where would they best be served within the strategy process? Bryan: Yeah. I think for companies that are again really serious about SEO and they want to do that, one of the areas that we've gotten involved is really early on in that process and mapping out ... again, here are all the different things we want to rank for, and what structure does the site have. Coming back to that, where, you know, within your blog or resources, things are structured similarly. You'll hear hub-and-spoke model sometimes from different people. Something like that. Sometimes when we come in with a company where it's a little bit more of a blank slate sometimes, we'll lay out this really large site structure of content. We can create enough content ideas to give the content team enough to do for literally years in some cases, there's so many topics they can cover. That's really a SEO-driven model, I think, where the SEO team is dictating the path and the content in a lot of ways. Sometimes that works and sometimes companies come up from the other angle, content's driving it a little bit more. In that case, I still think it makes sense. The SEO team should really be involved in the beginning. If the content team has an ideation process where they're listing out a dozen ideas or a hundred ideas, the content team can really add some research to that, some data to show these are all great topics, but there's a lot more people maybe searching for one. Maybe if it's okay, I'll share a quick example from one of our clients on that front. Anna: Yeah. Bryan: We worked with a company that makes hot tubs and spas. We helped them with a lot of their content. Our content team is coming up with ideas and thinking through some ideas, and as they were researching, they found this one that didn't sound super exciting or interesting, because we kind of kept digging and we found that there's just literally thousands of people searching for this and it wasn't very competitive. Our team put together this really nice, long blog post, it was about how to make your hot tub look nice on a deck, so if you searched for hot tub deck ideas, it shows up there number one. It turned out really great. Our team did a great job executing on that, lots of pictures, visuals. We even crowdsourced some of the content from different landscapers and things like that. It turned out really well. Again, on the surface, it wasn't super interesting. Our client wasn't saying, "That's the winner there. I want to go with that piece." But that one piece of content is actually the second most trafficked page on their whole website behind their homepage. Anna: Wow. Bryan: Yeah. That content drives more people into their site than their product they do. Which is awesome. It gives people an introduction to their company. We've seen in their analytics that people come into that page, and then there's a certain percentage that will branch out and actually look at the products, request information. It's a cool success story where SEO-driven research helped us create some really great content that drives people to the website. Anna: Well, I think what's fascinating about that too is that that's a topic that clearly people were looking for that brands were ignoring. I think a lot of times we have this tendency to think of SEO as how to rank or how to be seen by Google, but it's really about understanding another layer of user behavior, or even understanding people who, you know, prospective customers, understanding existing customers. We don't have a tendency to look at it through that user lens, which is really fascinating, because it's humans that are typing these search terms in. Bryan: Yeah. For sure. We worked with some clients where they have that customer journey or that content experience, showing where they go through. We love to map that out with SEO content. We find that people that have these questions along the customer journey or the FAQ type stuff, that's where we like to start a lot of our content creation for our clients. Those are people that are in the funnel already, they're already interested. It's not the super top of the funnel. We're able to help people, answer their questions, and drive them into our client's environment and funnel where they can work them down and hopefully create sales opportunities for them. Anna: Nice. Love it. Bryan, thank you so much for being here today. You have provided so much information and some great case studies, some amazing examples. I really hope all of our listeners out there take another look at the state of SEO today and really follow some of your advice, especially on the team organizational structure. In case anybody wants to get ahold of you and follow Big Leap, how can they find you? Bryan: Our team here does a much better job of sharing industry news than I personally do. If you want to follow along and stay on top of SEO industry news, I'd say follow BigLeapMarketing, that's for Twitter. It's BigLeapMKTG, shortened there. If you have any questions, anything on that front for me, LinkedIn is the best place to reach me. It's LinkedIn/in/bryanphelps. Anna: Nice. Thank you so much. All right. Bryan, now that we've gotten to know the professional side of you, we're going to get to know the personal side of you. Everybody, stick around, and we are going to have some questions for Bryan when we come right back. Anna: Hey, everyone. I wanted to take just a few seconds today to talk to you about Emma. Emma is an email marketing platform that helps you connect with your audience and grow lasting relationships. They're awesome. They offer really intuitive tools to build and automate emails with powerful segmentation and reporting too. The big difference is they're focused on you. Between their award-winning support and their pro services team, they make sure every customer has success with their email marketing. Seriously, they are amazing. You can learn more and request a demo today at Myemma.com/JayIsAwesome. Again, that's Myemma.com/JayIsAwesome. Anna: Hey, everybody. We're back with Bryan, and we are going to get to know a bit more of the personal side of him. All right. Bryan, you are a Utah native, which I think is amazing, because Utah is beautiful. There's a lot of great stuff to do there. Based on your recommendations, what should people be searching for great things to do in Utah? If people were to go to, like, the Bryan search engine, what should they be searching, and what would your top rankings of things to do in Utah be? Bryan: Yeah, no. That's a fun question. I think for me, I would be searching for top golf courses in Utah, because I love to golf. Utah is kind of a cool place for it. There's not maybe any super famous incredible beaches in Utah, but there's a lot of diversity in golf here, and just in the climate and things like that. If you go down to southern Utah, you'll get this red rock, red sand courses, and just the whole environment there, whether you like to golf or not. It's more of a desert feel. You've got these really cool red rocks that if you've ever been to Zion National Park or you've seen pictures, it's that kind of feel- Anna: It's gorgeous. Bryan: Yeah. It's amazing. You get these great, much better temperatures often in the winter, a little warmer down there. But then literally, you drive three hours north more where we're headquartered in Utah County and Salt Lake County and that's where you see, and closer to Park City where you see the snow and things like that, and of course the golf courses up here are a little bit more of a mountain type course, which are fun too. The golf stuff's fun, but ultimately that's what people love about Utah. There's so much diversity within just a couple of hours. There's certain times of year that you can literally ski in the morning and go a little further south and golf in the afternoon. Anna: Yeah. It's crazy. I know as the sister state, Arizona is like that as well. Utah I feel is drastically underappreciated. All right, everybody. You heard it from Bryan. Go find those golf courses, because they are picturesque and beautiful. Where else can you just go do all four seasons in one day almost? Gorgeous. Well, Bryan, thank you so much again for being on. I really appreciate it. Thank you so much for joining us once again. Go ahead and do us a favor and leave us a review wherever you listen to us. We'd love to hear what you think, and we'd love to dive into more topics that you want to hear, so leave us a review, because we appreciate your feedback. Until next time, this is Anna Hrach with Convince & Convert on behalf of Randy Frisch from Uberflip, and we'll talk to you next week.